Originally I wanted to put a blank spaceholder here in order to have a working link in the navigation bar of my aicraft pages, which I want to transform from draft to official state. But then I decided to create a page in a quick walkthrough. The pictures are taken from the old website and do not fit well in the new layout. I improvise with the text using some passages from the old books page and add some new text. Not the smartest design but these entries will be updated and improved later. When my father came back from a visit to the Industrial Fair in Hannover in 1961 he brouht me the booklet 86 Flugzeugtypen together with the catalogue of the German Air Fair (Deutsche Lufgtfahrschau). I think this booklet, pictured below made me an enthusiast for propliners once forever. 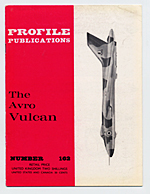 I assume I got the 1961 Flugzeuge der Weltt, the German issue of the Observer´s Book of Aircraft from William Green the same year as it was published. Next years' issues followed. This series let me get aquainted with contemporary civil and military aircraft. And these books introduced a new subject for me: Three view drawings. Since then I hunt for these and declared a book on aircraft only as good if there were such drawings. 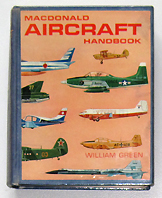 The first Observers were followed by William Green's 1964 Aircraft Handbook and the 1963 3rd. 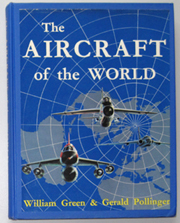 edition of The Aircraft of the World, which dealt with all aircraft still operative in the early sixties. There was another aircraft type reference book, Ken's Flugzeugtypen, which I also got from the library. There where 3-views but not for every entry and beeing written in German it was not so trendy for a schoolboy as my English language books. Only now I bought it for my collection. I in 1963 or 1964 at the age of fourteen there came just abother subject: World War II aircraft. 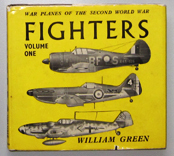 Fighters were introduced to me by the series War Planes of the Second World War by William Green. 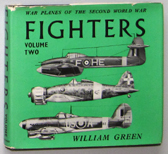 There were not only treated just the most famous fighters but there were treated all fighters from all countries which saw prototype or operational status in WW II. Amazig books,then and now. I look them up still today, though my interest in WW II warplanes has dercreased markedly. The bomber issues were not yet issued in those days and I had to rely on the two volumes of Famous Bombers from the same author, which a reduced scope of types. 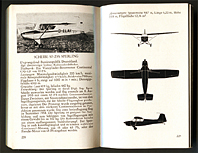 Die Beherrschung der Luft from John Stroud, the German, revised edition of The World Airways, pictured right. I suppose I loaned it from the local library in the early 1960's. More and more books followed, examles of which are the Proflie Publication series which introduced colored profile drawings and the Putnam series of Aicraft manufacturer's monographies. Pictures above: The 1961 and 1962 issues of Flugzeuge der Welt the German language edition of The Observer´s Book of Aircraft .